Lightning research. 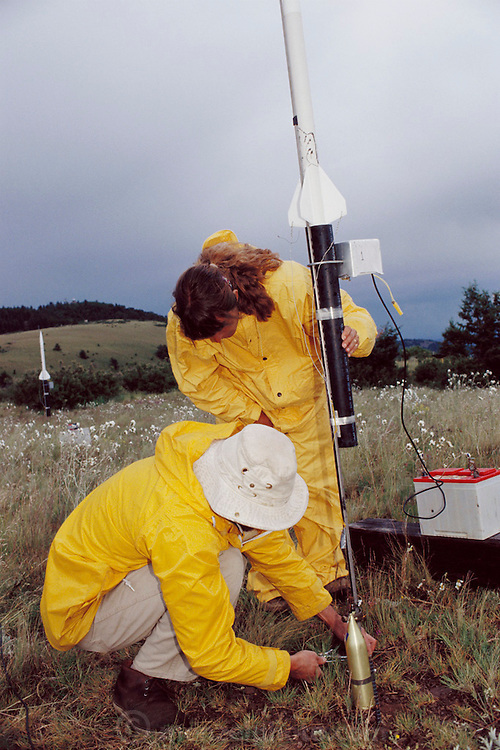 Scientists prepare a rocket designed to fly into a thunderstorm and trigger a bolt of lightning. The rocket trails a fine copper wire, providing an easy path for the lightning to reach Earth. This allows the scientists to measure the current, voltage and other parameters of the lightning bolts. To ensure safety, the rocket is launched by blowing through a tube to activate a pneumatic switch. This prevents the operator from making accidental electrical contact with the lightning. Photographed at Mount Baldy, New Mexico USA.